Create a reporter for a table that includes a title. table = BaseTable() creates an empty table reporter. Use its properties to specify the table content, automatically numbered table title, and table style and width. table = BaseTable(content) creates a table reporter that formats the content as a table and adds it to a report. table = BaseTable(Name,Value) sets properties using name-value pairs. You can specify multiple name-value pair arguments in any order. Enclose each property name in single quotes. See the mlreportgen.dom.Table, FormalTable, or MATLABTable properties. Inline content is content that a paragraph can contain. If the title value is inline content, the table reporter uses a template stored in its template library to format the title. The template automatically numbers the table title using a format that depends on whether the table is in a numbered or unnumbered chapter. 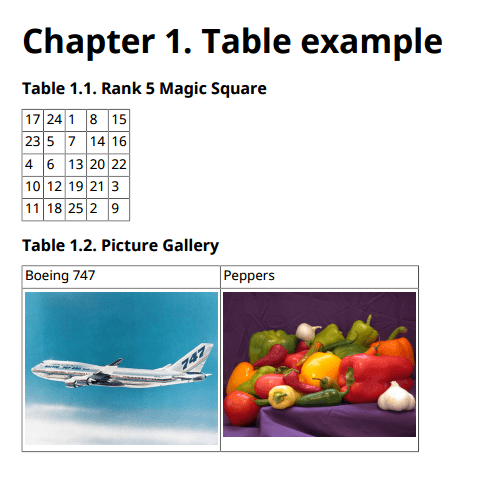 A table in a numbered chapter has a title text prefix of the form 'Table N.M. ' N is the chapter number and M is the table number in the chapter. For example, the prefix for the third table in the second chapter of the report is Table 2.3. A table in unnumbered chapter has a title text prefix of the form 'Table N.' N is 1 for the first table in the report, 2 for the second table, and so on. In many non-English locales, the title prefix is translated to the language and format of the locale. See the Locale property of mlreportgen.report.Report for a list of translated locales. Use the Section constructor or add method to set this property. You cannot set it directly. Name of style to be applied to the table, specified as a string or character array. The specified style must be a table style defined in the template used by the report to which you append this table or in the template of a reporter added to the report. An empty TableStyleName property value specifies a default table style defined for the template of the reporter. The default style for the table is a grid. Width of this table, specified as a string or character array. The TableWidth format is valueUnits, where Units is an abbreviation for the width units and value is the number of units. The table shows the valid Units abbreviations. Maximum number of columns to display per table slice, specified as Inf or as a positive integer. If the value of this property is Inf, all original table columns are included in a single table. A MaxCols value greater than or equal to the number of table columns also produces a single table with all columns. Large table data sets can cause illegible tables to be generated. Set this property to the number of columns from the original table that fit legibly on a page. To determine an optimal value, iterate setting the MaxCol value and viewing the report. Number of initial columns to repeat per slice, specified as 0 or a positive integer. A nonzero number, n, repeats the first n columns of the original table in each slice. The MaxCols property value includes the RepeatCols property value. For example, if MaxCols is 6 and RepeatCols is 2, each table slice has a total of six columns with the first two columns repeated from the original table. Name of the custom style to apply to the titles of table slices that this reporter generates. The specified style must be defined in the report to which this reporter is added. If this property is empty ('', "", or ), the slice titles use the default style defined in the reporter template. Add two tables to a report. The first table is a rank 5 magic square. The second table includes two images.